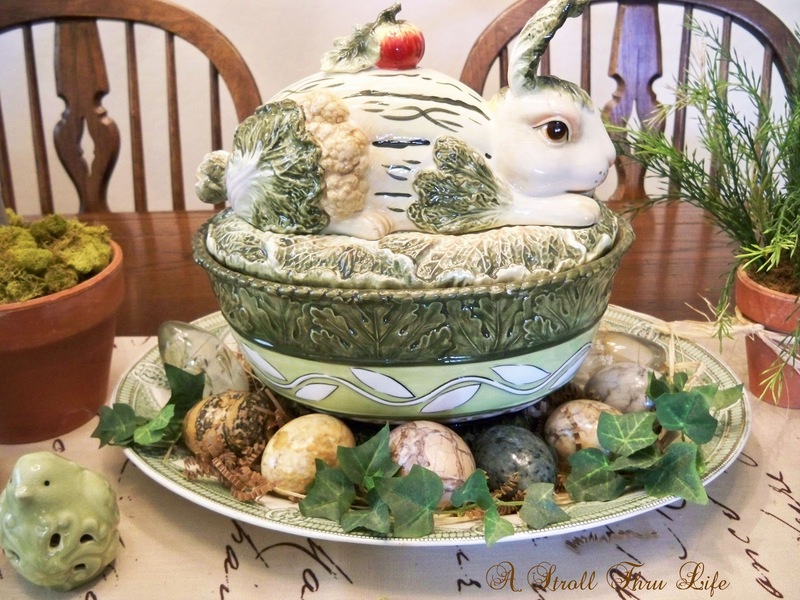 I love my Fitz & Floyd Bunny tureen, he makes a great centerpiece for the breakfast table. I thought he needed a few eggs for Easter, so I gathered my marble eggs to dress him up a bit. Each egg is different and the coloring and veins are beautiful. I think that is what makes them so interesting and unique. So how are you getting ready for Easter? See you this afternoon for Inspire Me party. LOVE the tureen & the eggs are so super gorgeous! Have a fantastic Sunday! Love your Fitz and Floyd bunny tureen ! It is fabulous ! The eggs look great with it ! Marty, your vignette is charming. Love your Fitz and Floyd tureen! F&F makes such wonderful ceramics. 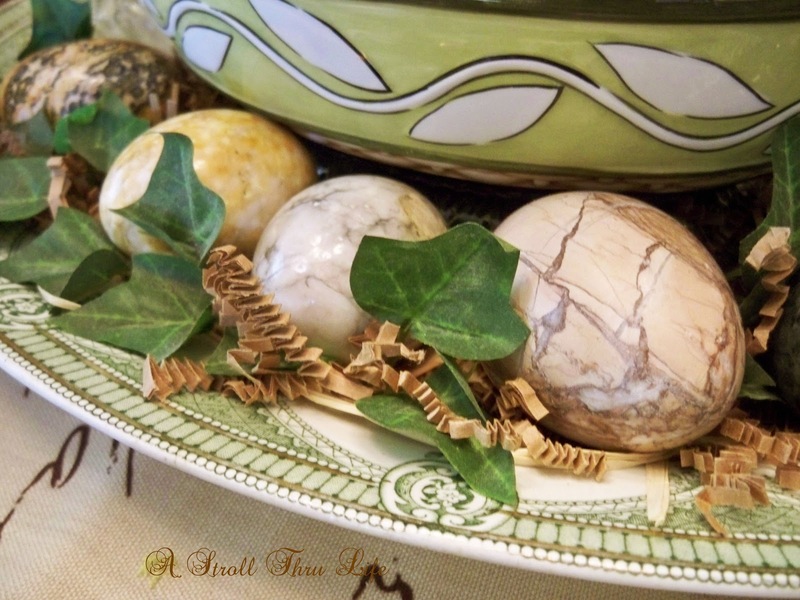 The marble eggs are gorgeous and compliment the tureen. The natural colors for spring are my favorites. 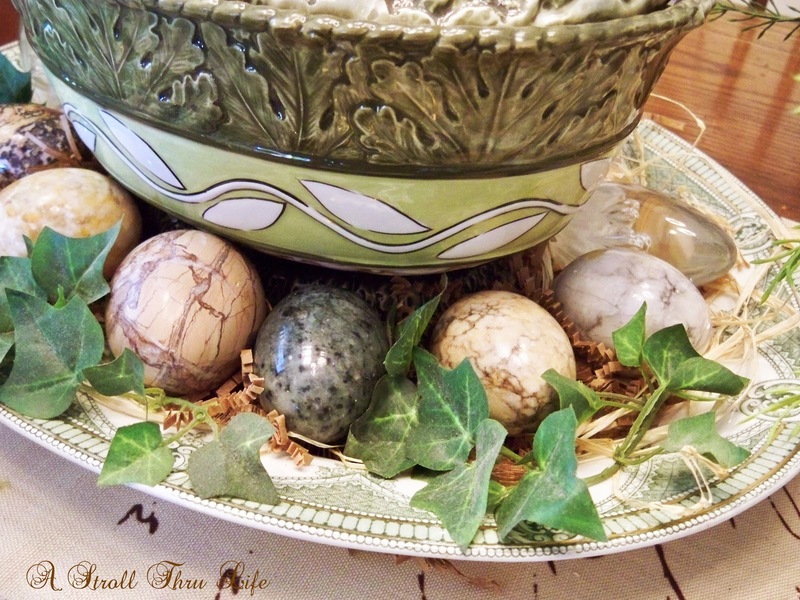 The tureen and marble eggs go so well together. Happy Easter, Marty. I am HOPING to be HOME for Easter!!! 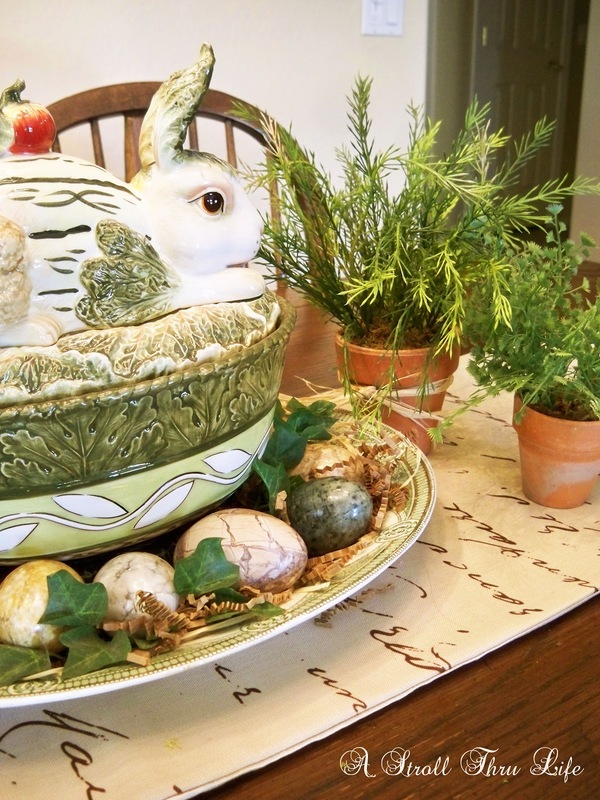 I have always hd Bunny tureen envy and now I am in love with the marble eggs too!!!! Happy Palm Sunday today. The F&F bunny tureen is to die for Marty! With those pretty marble eggs around it is just perfect for the Easter week coming and makes a wonderful centerpiece for the dining table ! I love it! Have a lovely Palm Sunday ! Love this!! I'll have to send you a photo of mine -- he's on the dining room table, surrounded by white bunnies with green ribbons running up and down the runner. Your tureen makes for a great centerpiece, Marty! I love the Fitz & Floyd bunny pieces. I have a few myself and never tire of looking at them. Great tureen and eggs! 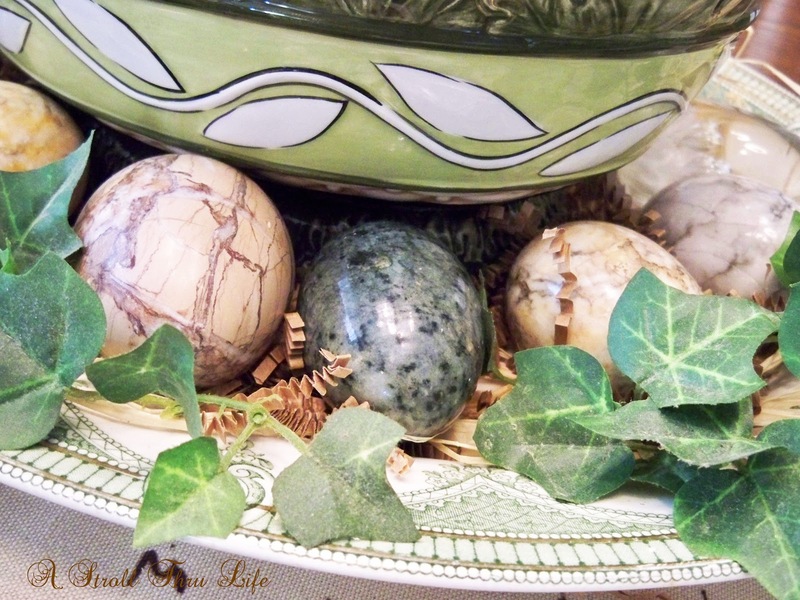 I have a few marble eggs I've collected from estates and love them. I'm getting ready for Easter with new perennial plants that will later be set in the yard, a cute little Beatrix Potter ceramic planter I picked up from an estate sale, and vintage dishes to set the table for a family dinner I'll be hosting. Of course, I'll be pressing vintage linens, too. Have a wonderful week, Marty! Your tureen caught my eye immediately at Seasonal Sundays. A beautiful table, Marty! That looks lovely! Beautiful tureen. Here from Seasonal Sunday. How cute is that bunny! Beautifully decorated table! :) Happy Palm Sunday! I am in the middle of moving, so no Easter decor here. I just LOVE that bunny! Especially the colors. It's really beautiful, Marty. Oh, how pretty! I love the eggs added to your bunny tureen! Very beautiful!! I love your bunny and especially that color green! the marbled eggs look great with it. I love your bunny centerpiece. It's so elegant. Love the bunny and marble eggs....So cute. I love the bunny. I also noticed the picture of the man praying on the wall. I grew up with that picture. My mother had one just like it. It was her favorite. Your bunny centerpiece is so cute, Mary. It brought back memories of growing up when my mom used a ceramic bunny surrounded by pretty eggs for the table in the spring. Marty, Your Fitz and Floyd bunny tureen is so pretty. I think F&F makes some of the prettiest things. And would you believe I was looking at marble/alabaster eggs in an antique/decor store, just last week? Yours are prettier,though, with the different markings on each. Hope you have a wonderful Easter. They're beautiful Marty...love the way you have them displayed around that pretty tureen!! What a pretty display for Easter! Wow! Those marble eggs are gorgeous! I love your bunny tureen too! Wonderful centerpiece! Those eggs are wonderful and look great around the tureen. 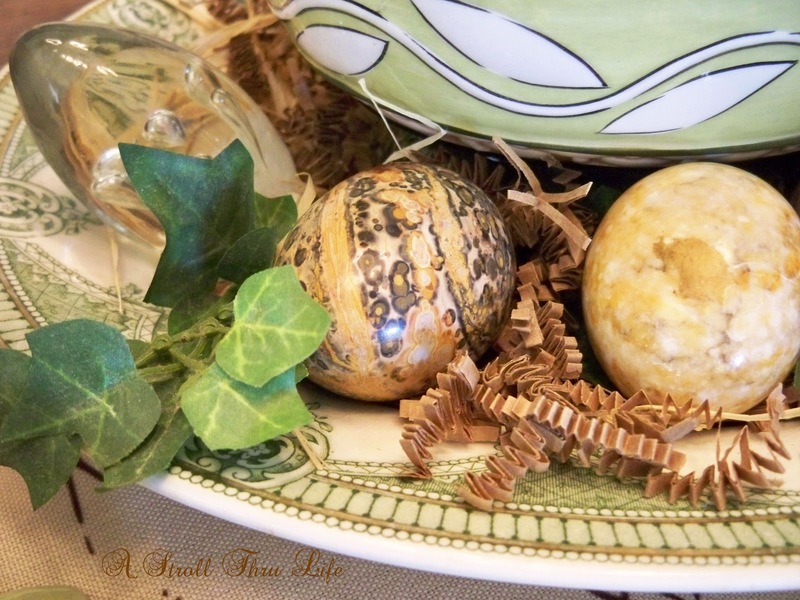 Your table looks extra special with the sweet bunny and marble eggs. I feel a little guilty, I haven't done one thing for Easter decorating. I love the earthy tone of your eggs. They look perfect with the tureen. OH so cute - it all ties in so beautifully and perfectly together, Marty! I have always loved Fitz & Floyd pieces and those marble eggs are AMAZING! I hope you have a wonderful Easter with your family. God Bless. Wonderful way to decorate for Easter. 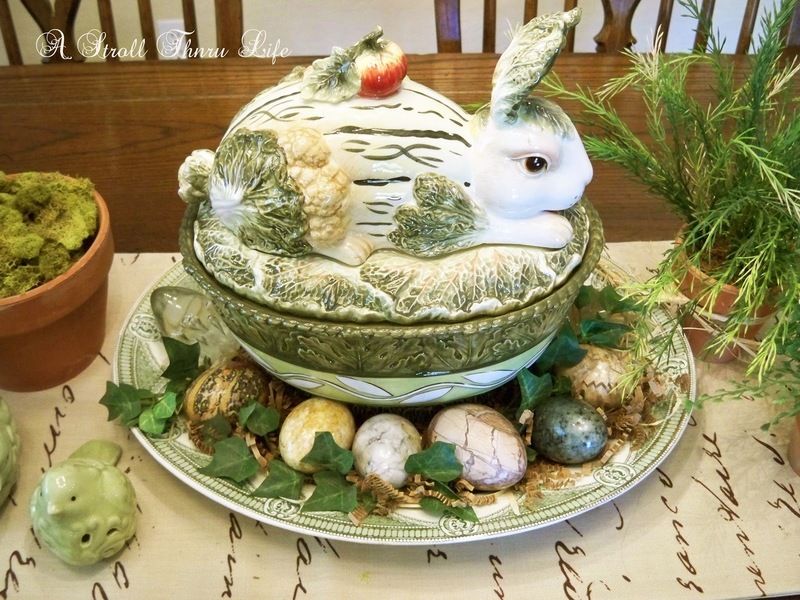 The F&F bunny tureen is a beautiful creation with the marble eggs in lovely colors. I bought marble eggs while on a vacation to Mexico but I chose the bright colors but yours are so pretty in the natural shades. Have a Happy Easter! 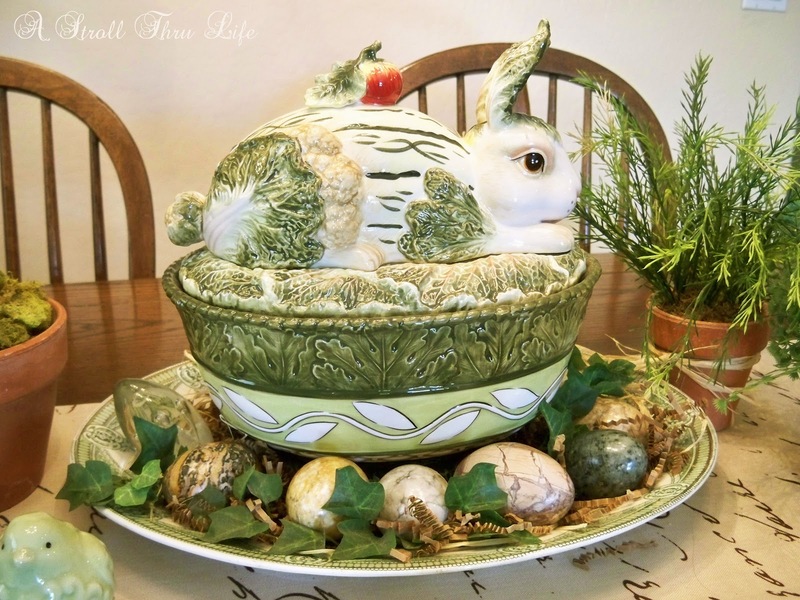 Love your bunny tureen. The marble eggs add such a nice touch! This looks perfect Marty, I love the way you used brown paper squiggles with the ivy for the eggs to nest on! The tureen and the eggs...absolutely beautiful! Love your Fitz & Floyd Bunny tureen! Makes a beautiful centerpiece. I love your bunny tureen Marty! Very nice! Oh Marty, that is just a precious little bunny! I love it, can't ever go wrong with Fitz and Floyd! I'll be back to join in on the party! You are always such a gracious hostess! Like everyone else, I love the tureen. I hope you had out long enough to really enjoy it. Happy Easter, Marty. Beautiful tureen and so cute it looks on the table. Love those marble eggs too, wish I had a few. Enjoy your Easter with your family. 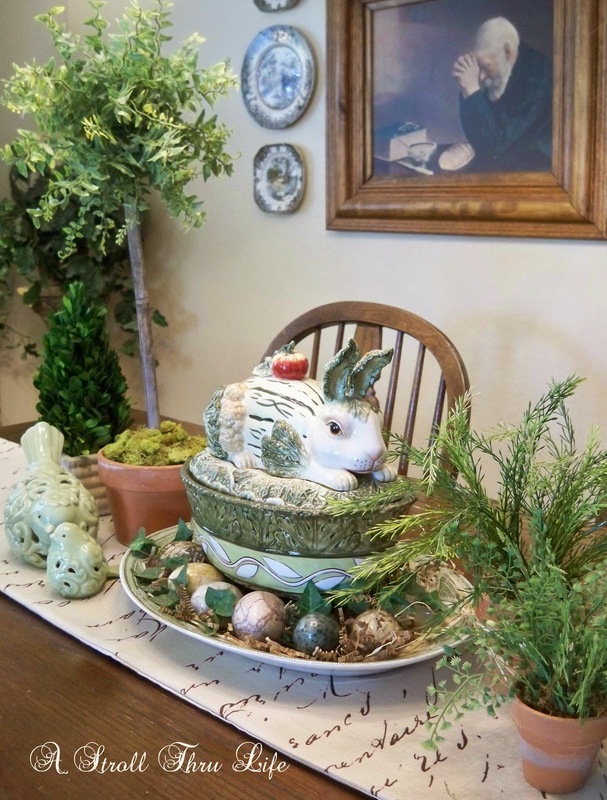 I love your Bunny Tureen as the centerpiece. You look ready for Easter :-) Wishing you a blessed day! Love this! I am going to feature it at Sundays at Home today!